Senior multi-participant Mariah Cunningham competes in the high jump at the WSU Indoor Open on Jan. 18. Cunningham competed in the 200-meter dash, 60-meter hurdles, high jump and long jump at the event. In spring 2018, Mariah Cunningham had a decision to make. The senior forward from Central Valley High School in Spokane had exhausted her four years of NCAA eligibility for basketball, but had the option to play one more season. The catch? She’d have to switch to track and field, a sport she hadn’t played since high school. Cunningham was on the fence about switching to track for the 2018-19 season until a conversation with Schuller, who reminded her that EWU had offered her a spot on both teams originally. Cunningham high-fives teammate Baylee Rexing on Feb. 22, 2018. 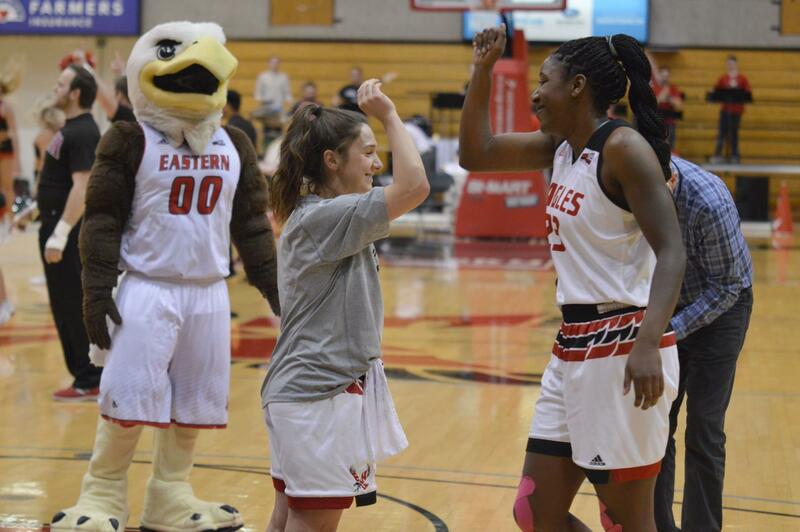 In her EWU basketball career Cunningham averaged 2.6 points and 2.1 rebounds in 113 games. Cunningham is listed as a multi-participant on the EWU track and field roster. Multi-event and jumps coach Dave Nielsen decided to place her in the heptathlon, a competition that features seven disciplines: 60-meter hurdles, high jump, shot put, 200-meter dash, long jump, javelin and 800-meter run. Nielsen has quickly noticed what Cunningham brings to the track team. In high school at Central Valley, Cunningham earned four letters in track in addition to playing basketball, volleyball and cross-country. She holds the school record for long jump, an event she’s enjoyed picking back up as she transitions back to track collegiately. “My favorite is long jump because that’s what I did in high school and what I’m successful at,” Cunningham said. Cunningham acknowledged the difficulty of returning to a sport she hadn’t played in four years. She said some of the main adjustments to playing track collegiately after four years of basketball has been the less-rigorous practice schedule and change in weight training. During Cunningham’s four years on the women’s basketball team, the six-foot forward averaged 2.6 points and 2.1 rebounds per game. She played in 113 games, starting in 43. In 2016-17 she was named to the All-Big Sky Academic Team. Her career high in points, 14, came at Creighton on Nov. 28, 2015. Cunningham praised her experience playing basketball for the Eagles. Schuller praised Cunningham’s work ethic and ability to improve. Schuller added that Cunningham’s on-court strengths were athleticism, speed and back-to-the-basket play. 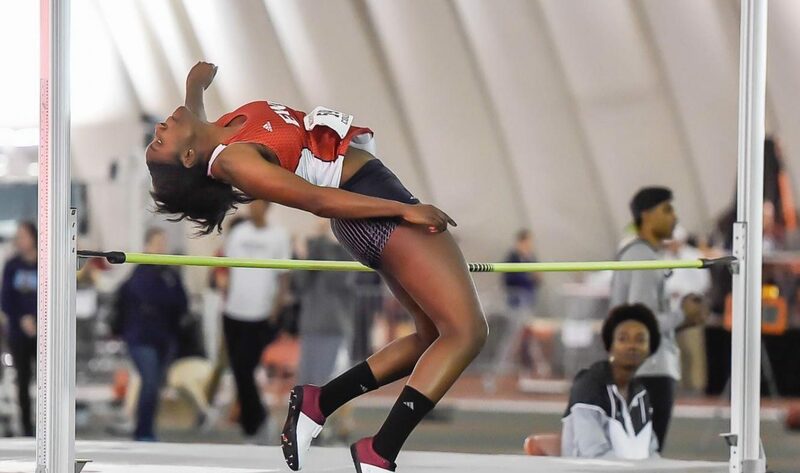 On Jan. 18 and 19 the EWU track and field team participated in the WSU Indoor Open in Pullman. The women defeated WSU and Central Washington, with Cunningham finishing 19th in the 60-meter hurdles and 25th in long jump and the 200-meter dash. EWU will travel to Seattle next weekend for the University of Washington Invite on Jan. 25 and 26.